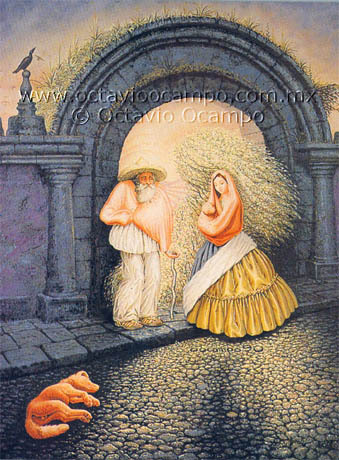 This popular piece of work from artist Octavio Ocampo is as much a puzzle as it is an illusion. The piece centers around two people in an archway, the combination of which creates the image of a male's face from the side. There are many different faces in the picture, some are even up in the sky. See if you can find them all. any tips to find the faces or any clues please! i found 9 faces.but how many do you need to find? i don't how many are there in all..
i see 5, as for tips the one in the sky that i see is the one next to the bird. It looks like a little person there is also a man on the man's face, and another face right above the o in campos.